Great Big Birthday Announcement! | Keep It Up, David! HAPPY BIRTHDAY! It was 33 years ago today that I was born at St. Joseph Mercy Hospital in Pontiac, Michigan. Yep – 33 years down, and a helluva lot more to come! I’ve been thinking a lot lately about what I can do for myself in honor of my birthday. I’m sure I could find something to purchase, but nothing special is coming to mind, and it’s probably not a wise choice anyway, since money is a little tight. What I’d much rather do is honor myself by making a new commitment to continued good health. I want to challenge myself to kick off my 33rd year with a bang. I want a big, grand, sweeping adventure that embodies the idea that I’m not done keeping it up. And I know exactly what I’m going to do. I’m announcing my new workout goal! No, David, think BIGGER. This is your BIRTHDAY! You can do better than that! Okay, okay, you’re right. Time to step up my game. I’m announcing TWO new workout goals! And they both involve lots and lots of stairs. Before I get to the details, I have a little catch-up to do. You all know about my Skyscraper Collection, right? Every time I complete a StairMaster workout, I find a skyscraper somewhere in the world with an equivalent number of floors to what I just climbed. Click here to see my Skyscraper Collection – so far, there’s 23 buildings in it, and right now I’m adding buildings 24 and 25! I’ve used the StairMaster twice in the past week at the gym, and they were tough workouts. I didn’t set any new records (like I did a few weeks ago when I climbed the equivalent of the Empire State Building), but I’m really happy with the results. On Monday, 2/27/12, I spent 21 minutes on the StairMaster, and climbed 94 floors while burning 350 calories. Yesterday, on Sunday, 3/4/12, I spent 18 minutes climbing 83 floors, burning 300 calories. Not too shabby! 23 Marina is 90 stories, the second tallest all-residential building in the world, and the third-tallest building in Dubai. It’s terribly exclusive – there are only 288 units in the entire building, including 57 two-story units that each have a private elevator and a private pool on a balcony. No joke! Start saving your pennies now! The photo was taken in October, when the top was still under construction. I can’t tell if the building is officially finished or not, but according to the interwebs, lower-level apartments have been turned over to their new owners. 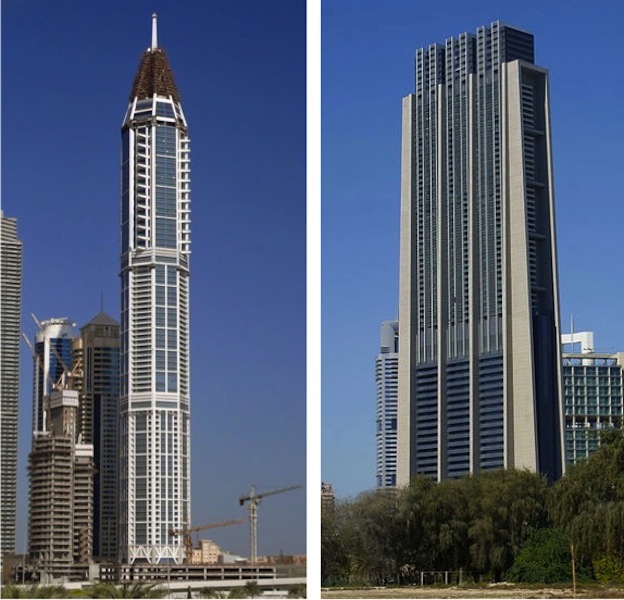 The Index is 80 stories – the 6th tallest building in Dubai. It was completed in 2010, and is a mix of residential and office. It’s cleverly designed so the concrete cores at both ends shade a majority of the building from the rising and setting sun, drastically slashing energy needs and air conditioning costs. …it’s time for my TWO BIG BIRTHDAY ANNOUNCEMENTS! I love my Skyscraper Collection. It’s changed the way I think about StairMasters. I used to hate them, but now I look forward to using them, because I find doing the research and adding the towers to be so much fun. But I want more than just pretending to climb skyscrapers. I want to climb a real skyscraper. So… drum roll please… I just registered for the American Lung Association’s Fight For Air Climb 2012! ANNOUNCEMENT #1: On Saturday, March 31st, I’m climbing the 63-story Aon Center building in downtown Los Angeles! It’s the second tallest building in Los Angeles, and was the tallest building west of the Mississippi from its completion in 1973 until 1982. Take a look at it (the center building) – it’s tall! Here’s the best part – you can support my quest to climb to the Aon Center’s roof! The Fight For Air Climb is a fundraiser, and I need to raise $100 in order to climb the stairs. It’s not that much money, really – if 10 of you donate $10 each, I’ll be set. Or, 20 of you could donate $5 each. It doesn’t matter to me! Why don’t you talk amongst yourselves, figure it out, and when you’re ready, visit my donation page to make a contribution. All the money benefits the American Lung Association, is tax-deductible, and you can search their database to see if your company has a gift-matching program, which doubles the value of your donation! I’m so excited to climb a real-life skyscraper, and I’m looking forward to standing on that roof, 858 feet off the ground, sweaty and exhausted, looking out over the city around me – hopefully it’s a clear day! ANNOUNCEMENT #2: I’m setting a new StairMaster goal to add the tallest building in the world to my Skyscraper Collection. Pop quiz: What’s the tallest building in the world? Anyone? Anyone? Bueller? It’s the Burj Khalifa, in Dubai (this goal was why I picked those two other Dubai buildings above). It is an astonishing 163 stories tall. Whoa! It’s nearly twice as tall as the Empire State Building, and almost three times as tall as the Eiffel Tower. It’s just a monster of a building. Does it look familiar? That might be because it was prominently featured in Mission Impossible: Ghost Protocol – Tom Cruise clung to the side of it, thousands of feet above the ground, wearing only suction-cup type gloves. Reaching this goal will not be easy, and that’s exactly why I’m setting this challenge. My current StairMaster record is 104 stories (a good 59 stories shy of the Burj Khalifa), and after those 104 stories, I felt ready to collapse. So I have work to do in order to push through. I think it might be too much to try to reach my Burj Khalifa goal before I do the Fight For Air Climb. Perhaps I’ll shoot for sometime in April. I’m not sure yet, we’ll see how my training goes. Whatever I decide, I will keep you posted! This entry was posted on Monday, March 5th, 2012 at 1:11 am and is filed under Uncategorized. You can follow any responses to this entry through the RSS 2.0 feed. You can leave a response, or trackback from your own site. 16 Responses to Great Big Birthday Announcement! Oh! Look! You’re a quarter of the way up that ‘scraper already! And Xerox is matching! Even better! Keep it up, David! And… Happy Birthday, too!!! Thank you for everything you do… and thank you for helping me keep my eye on the goal. Happy Birthday David!!! Great goals and it will be fun to climb the climb with you via your blog. As always, great and inspiring read before I start my day every morning. Thanks! Happy Birthday, love your goals, looking forward to hearing how it goes. Happy birthday David! I can’t think of a better way to celebrate your birthday while pushing yourself to do more. You’re a rock star! Keep it up, David! Thanks (always) for your entertaining inspiration! Bréithlá Shona duit ……..Happy birthday in Irish from Ireland!!!!! Happy birthday almost twin brother from anotha mothah. My b’day is Sunday and I’ll be 31. We’re old. Good luck on the climb. I tried to donate but the website wouldn’t load. Remind me again and I’ll see if I can find $5 to give you. Happy Birthday! I actually hopped on the stair climber for the first time the other day and totally thought of you. I was actually thinking on how the machine differs from the real thing… good luck David!! Happy Birthday! I tried to donate, but it didn’t take me to your direct page. May want to check your link and do it again…I’ll give! I’m excited for you! Happy, Happy Birthday David! It was so nice to reconnect with you the other night at the Peter’s home. Adam and I both have just been devouring your blog the last few days. I love your vulnerability, I love your honesty, your positivity and most of all your determination. It is so nice to know another blogger (you know, from “real” life 🙂 I absolutely adore your spin on stair climbing – pure genius. Thank you so much for taking the time to stop by my site and peruse – it means more than you know, except, you probably do know. Be well my friend and, of course, keep it up! Great to see you guys again and hope to see you soon. In the meantime, I can’t wait to read more of your blog. Talk soon! The ONE day I miss your blog! Happy Birthday David!! We have the same birth date 🙂 I love your new goals and my goodness, 104 floors alone just makes me break out into a sweat. Good for you!